You Tube - Oh! You Pretty Woman, Willie and the Wheel with Floyd at the keyboard. Floyd Domino's dazzling boogie-woogie piano styling is known to audiences around the world earning him acclaim and awards for over 3 decades. 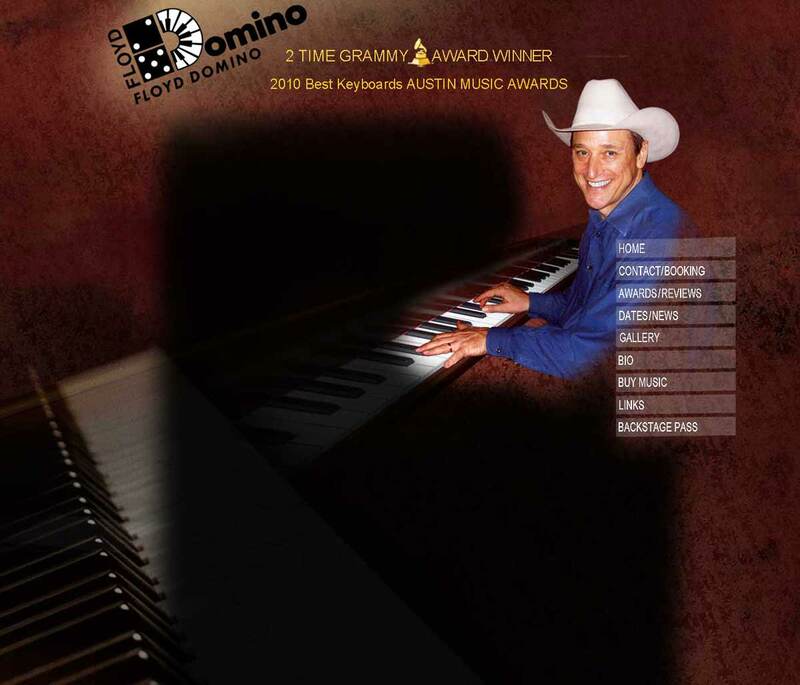 Floyd Domino brought home his Best Keyboards Award this April to keep company with the two Grammy Awards won for featured work with Asleep at the Wheel. and performed with Merle Haggard, George Strait (5 albums), The Texas Playboys, Waylon Jennings, jazz guitarist Herb Ellis, Kelly Willis, Bruce Robison, Monte Warden, Don Walser and the Crickets to name a few. Over and above his numerous awards Austin-based Floyd Domino has played at the Kennedy Center, Inaugural events and has even been heard in outer space by way of George Strait's #1 hit, "Ace In The Hole", beamed up to the crew of the space shuttle Columbia in a wake-up call. events. He often adds his talents to further Roots Music appreciation with appearances at schools, camps and other learning organizations. Few can match Floyd's "backstage" view of the American music landscape. A native of California, Floyd Domino was introduced to Western Swing by way of the musicians who had migrated from Texas and Oklahoma in the 30's and 40's. Floyd's close association with Western Swing coincided with joining Asleep at the Wheel at age 19. Floyd has released six albums of his own. Among them are Hightower Boogie Woogie and five others for children: Baby Road, The White Album, The Four Tots, Peggy Sue with Buddy Holly's Original Crickets, and Sleepy In Seattle. "Like me, Floyd plays from the heart, it's real and I can hear it in every note he plays. "